Alrighty! Halloween is next Sunday and I wanted to hurry and share one of my fall favorites before the big day. I love to serve this on Halloween, its in the slow cooker for 4 hours before its ready, so its great to prepare ahead of time and enjoy before, after, or during trick or treating. 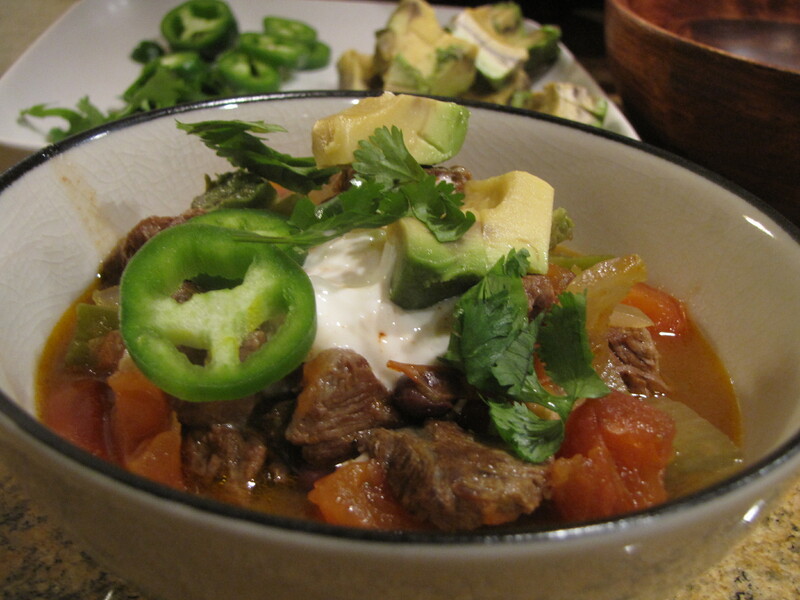 Who doesn’t love a hot bowl of delicious chili on a cold night? Serve this chili with the sweet corn and bacon empanadas. Its great for crowds or just the family, you won’t be disappointed! 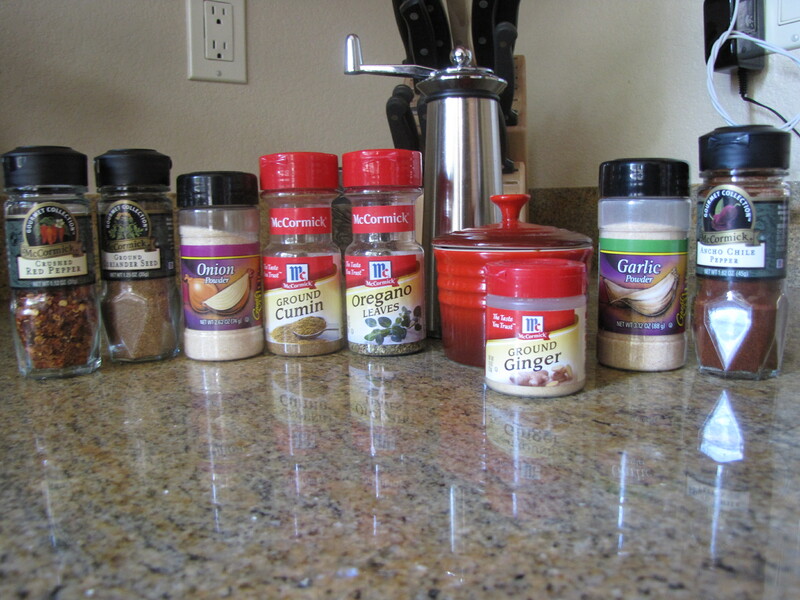 Stir together ingredients for fajita seasoning, set aside. Heat 1 Tbsp. oil in a soup pot or dutch oven over med-high heat. Brown half the meat in oil; transfer to slow cooker. 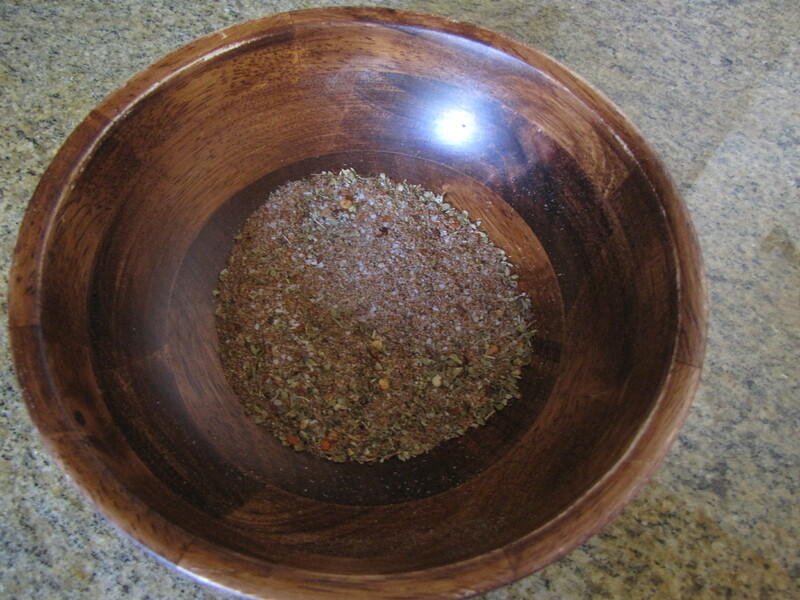 Brown remaining meat in 1 Tbsp. oil and transfer to slow cooker. Deglaze pot with tequila, scraping up flavorful bits from the bottom. Add to slow cooker. 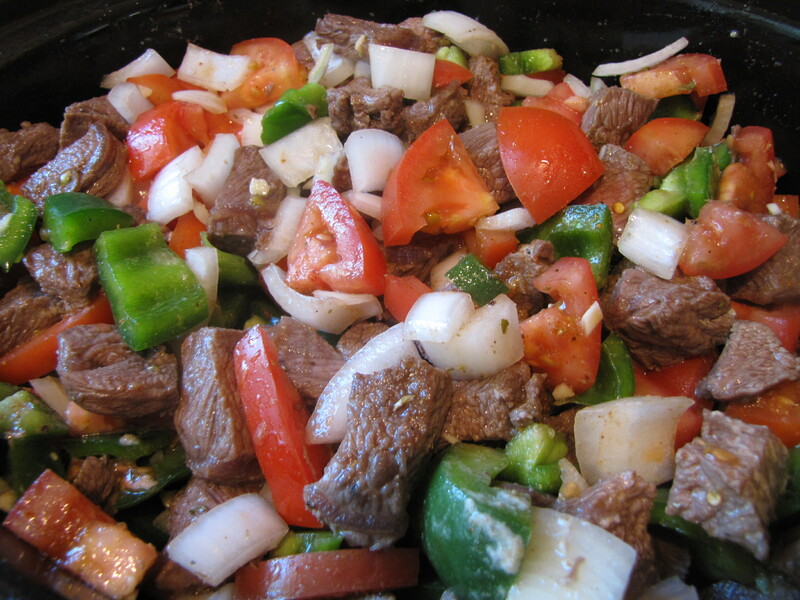 Add tomatoes, bell peppers, diced onion, minced garlic, and fajita seasoning to slow cooker. Stir in beef stock and flour. Cover and cook on high for 4 hours. Stir in beans and lime just before serving. 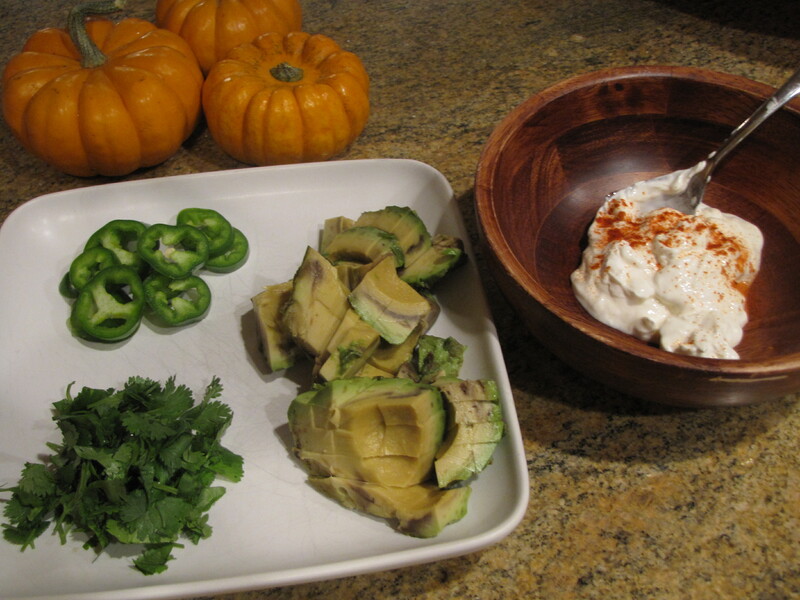 Garnish with Sour cream, jalapeno, cilantro, and avocado. Let’s talk about beef. When I was growing up I thought I didn’t like steak. Or any red meat for that matter, the reason why is because my dear family didn’t know how to properly cook a steak. Once I met my husband who worked in a famous steakhouse in San Francisco for some time, I learned the error of my ways and that in fact, steak is delicious. Rule # 1. This is the golden rule. Never ever, ever order your steak well done or medium well. That is red meat blasphemy. And don’t over cook it at home, either. The correct way to serve steak is medium rare. If you are a novice at this “but its still bleeding! !” business, then start out medium, that is acceptable enough that the cook in the kitchen and your server won’t be rolling their eyes at you from the kitchen. But what about ecoli? Salmonella? With beef (remember this is not the same rule for pork and never chicken) the bacteria is only on the surface. Yep, the part the gets cooked, so you are at no risk of getting sick. Now, the exception is ground beef. Since it has been ground, all throughout the meat has been exposed to air and therefore has the potential to be contaminated. For this reason, its acceptable to go medium well or even well done if you are very cautious. Rule # 2. Throw out the A1. Clear your fridge of any and all steak sauces. If you cook your steak right, you won’t need any. It will be tender, juicy and delicious on its own. 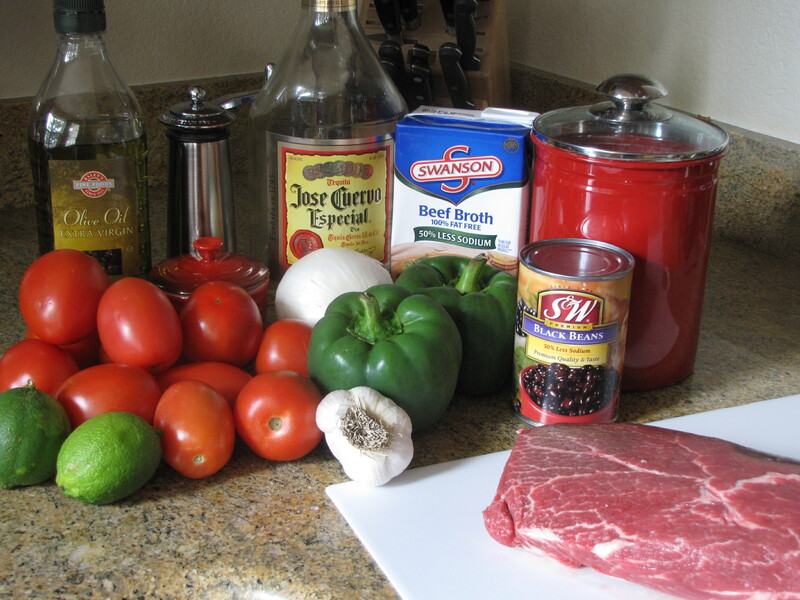 The purpose of steak sauce is to cover up a dry, over cooked meat and that has no flavor and is a chore to chew. And we’ll end this lesson here, for today. Next time you are having a steak, just TRY it. You will be very impressed. All I can say about this recipe is this: If you only ever try one recipe that I recommend on my blog, let it be this one. 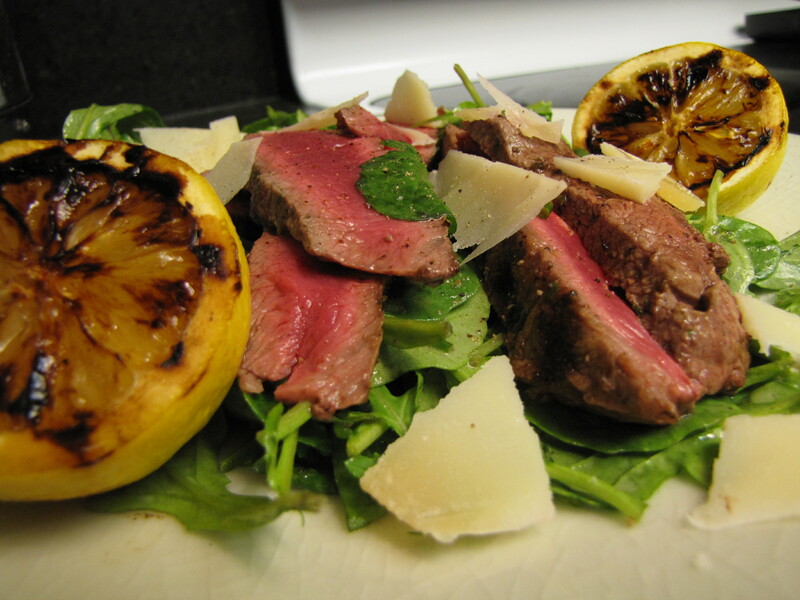 Usually I find arugula a little too bitter for my tastes, but the citrus counters any bitterness, the juice from the grilled lemon is divine, top it with a perfectly grilled, perfectly seasoned steak and you have an amazing, simple, fast and absolutely delicious dinner. Heat a grill to med-high heat. 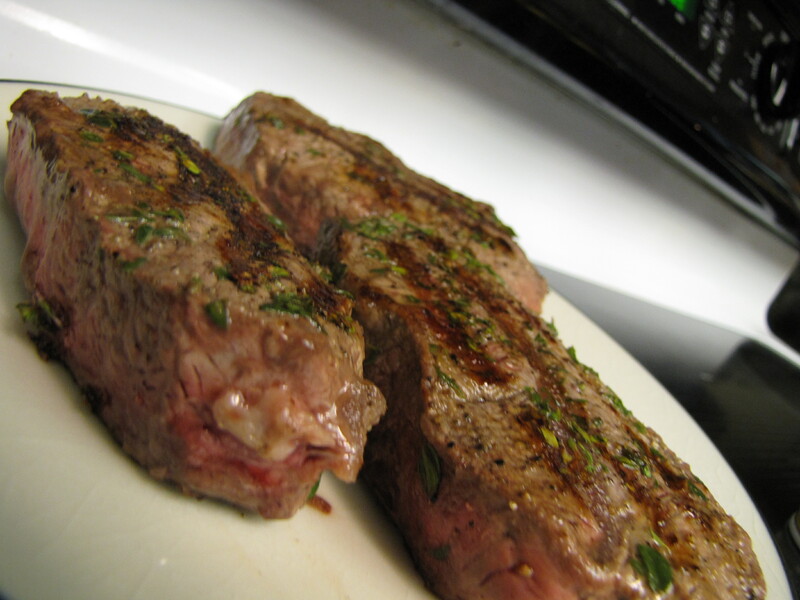 Rub thyme, 1/4 tsp salt and 1/4 tsp pepper over steaks. 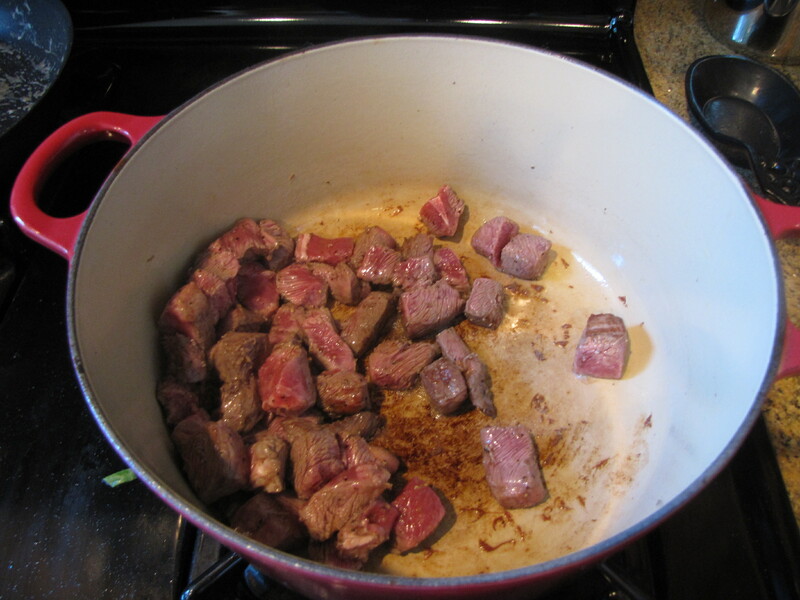 Add steaks to pan, cook 4 minutes on each side or until desired degree of doneness. Remove steaks from pan. 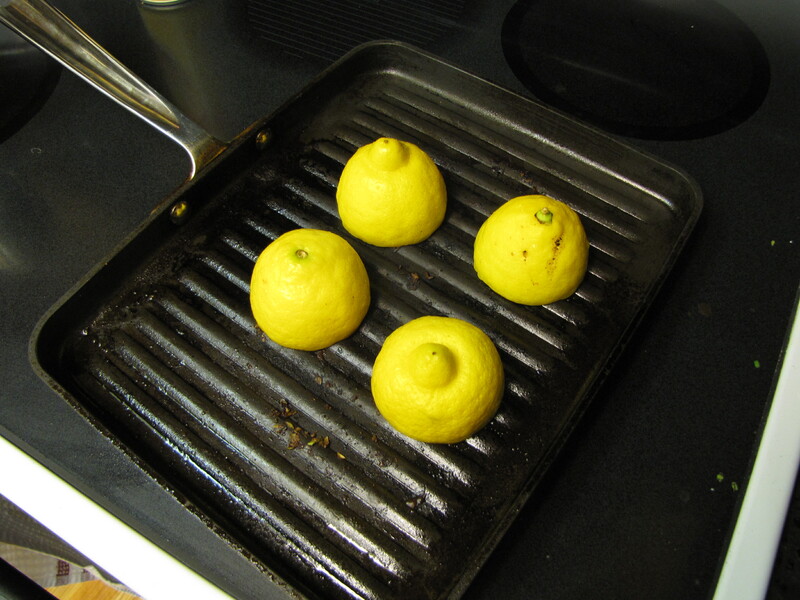 Add lemon halves, cut sides down cook 3 minutes. 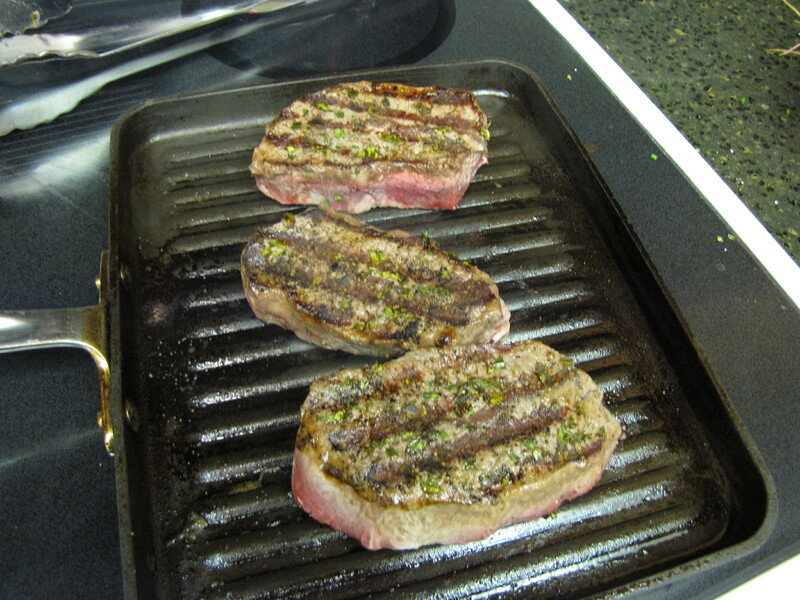 Cut steaks across the grain into thin slices. 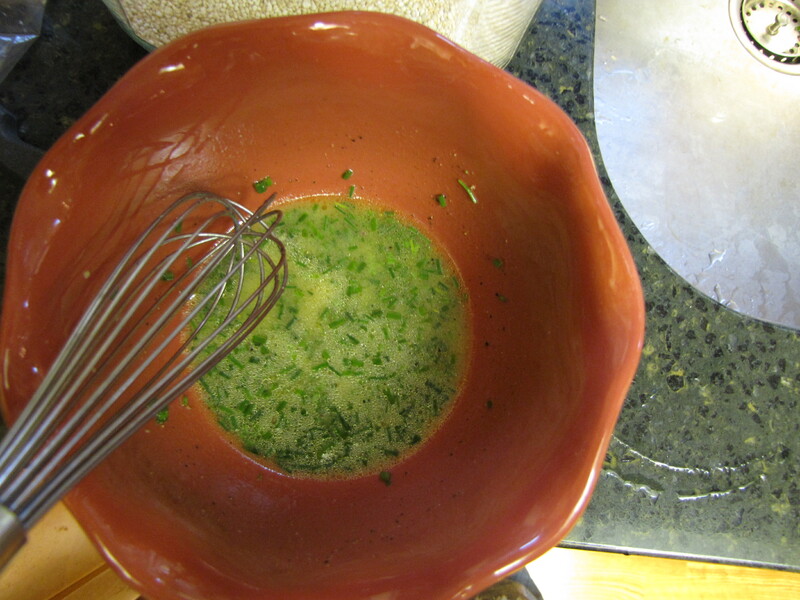 Combine remaining 1/4 tsp pepper, chives, oil, lemon juice, mustard and 1/8 tsp kosher salt, whisk together. Drizzle over arugula, toss to coat. 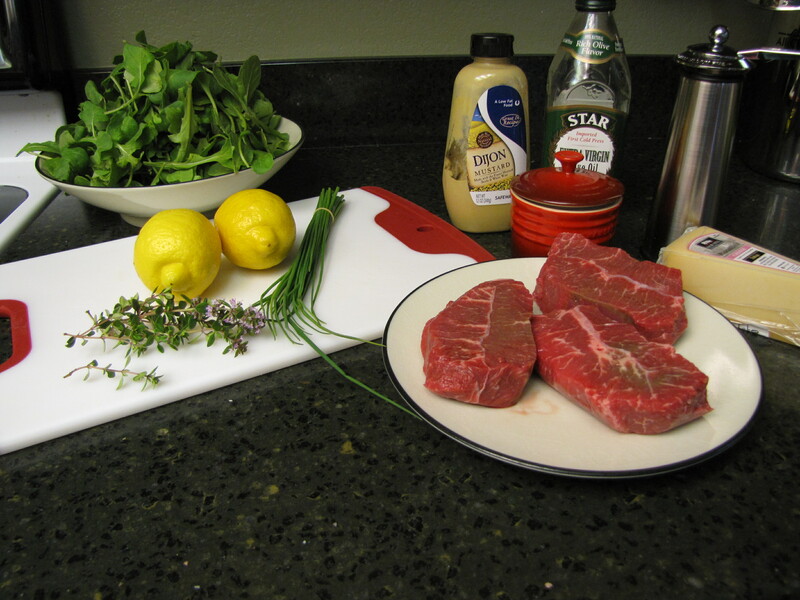 Arrange 1 steak, 1 cup of arugula and 1 lemon half over each plate. Top each salad with 1 tbsp cheese. Yield 4 servings.